Summary: Living in 1943 with three older brothers fighting in World War II, Robert finds solace in reading his comic book adventures. An encounter with a meteorite leads to Robert carrying around a piece of an exploded star, and it seems to have magical powers as meteorites start appearing in his favourite comics. Convinced the superheroes he reads about are connected to his brothers, Robert uses his allowance to follow their adventures. 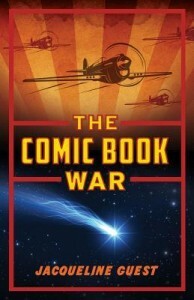 But when wartime rationing causes his mother to use his allowance to buy war stamps, Robert must find another way to purchase his monthly comics and do what he believes is his part to keep his brothers safe. Review: Somewhat reminiscent of The Reluctant Journal of Henry K. Larsen, The Comic Book War by Jacqueline Guest is a touching look at how one young man reacts to the stress of his three older brothers being in constant danger while away at war. I enjoyed the cultural exploration of Canadian comics while the embargo on American goods took place during the war and the historical aspect of life during WWII, but mostly I just loved the characters and the story itself. Even though I saw Robert’s connection between his comics and his brothers as a grief reaction, there was a little part of me that believed the meteorite did have special powers and caused the comics to be prophetic. I was taken up by Robert’s story, hoping beyond hope that he could protect his brothers through buying and reading the comics. Like his neighbour, Mr. Glowinski, tells Robert, he would do anything to have saved his family, Robert, in his own unique way, is trying to do the same thing. Robert’s journey is heartfelt and genuine. He grows throughout the book, getting over his aversion to girls and learning to work hard to earn money. His determination is equalled by Charlie’s (Charlene), and once he realises that they become good friends. But being a telegram delivery boy during the war is tough job, as it often involves delivering bad news about loved ones. When Charlie shows up at his door with one such telegram, Robert is still convinced his comic books will give him insight into saving his brother. But I think what I loved best was that when the magical thinking ended, Robert had two people who understood and supported him to see him through: Charlie and Mr. Glowinski. Their collective view of friendship will give Robert a solid foundation to build on as he begins to deal with reality once more. I can easily see why Guest’s book made the Red Maple Forest of Reading list this year. The Comic Book War by Jacqueline Guest is published by Coteau Books, (2014). This book was truly amazing. I read this book in Red maple and it taught me a good lesson. The lesson was that when a family member goes to war, we should be happy of what they have done not if there alive or not.I love it!!!!!!!!! !